EFOY Pro Fuel Cells are designed for a demanding professional use and provide a reliable and easy access to energy in all situations where no electrical grid is available. The EFOY Pro fuel fell enables both 12 V and 24 V battery usage. Fuel cells are also suitable for hybrid systems as they can be used alongside solar and wind power. EFOY Pro fuel cells work with methanol, which enables a long operating time. For example, the 28-liter M28 cartridge contains 31 kWh electrical energy. For example if a continous electrical consumption is 30 W, operating time is almost one and half months with a one M28 cartridge. There are four cartidge sizes available from a 5 liter M5 tank to a 60 liter MT60 tank. Up to four containers can be connected to a single fuel cell. EFOY Pro is an easy-to-use way to generate electricity in difficult conditions. The fuel cell can also be remotely operated via a separate GSM modem if needed. It is possible to connect EFOY Pro fuel cells to the Modbus using a separate adapter. Typical applications where EFOY Pro fuel cells are used are measurement and control systems, traffic control and backup power systems. The fuel cells are practical for any application requiring a quiet, secure, and long-autonomous power supply. 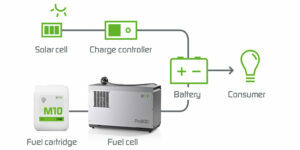 There are three models of fuel cells: the EFOY Pro 800, the EFOY Pro 2400 and the EFOY Pro 12000. The EFOY Pro 800 and 2400 are available as a model that allows a connection of two methanol cartridges. With two separate adapters (DuoCartSwitch)up to four cartridges can be connected to a one fuel cell. You can download the EFOY Pro 800 and 2400 fuel cell brochure here. 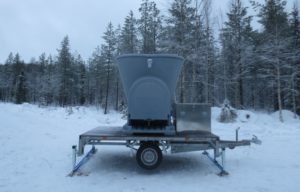 Winter solutions designed and manufactured by Hydrocell also work in the winter of Finland. More information is available at our sales!